Oakshade Raceway braved threatening skies in a futile attempt to get through the UMP Late Model Season Championship Night. All of the UMP Late Model heat events were completed with Devin Shiels, Brad Eitniear, Rusty Schlenk and Kris Patterson each picking up a win. Schlenk also won his UMP Sportsman heat which proved to be the final event of the night. Many racers joined the track crew in an effort to run the track back in after the first downpour. After a little over an hour, the track began to look like it might be raceable after a little more work, but then the skies opened up once again canceling the rest of the program. 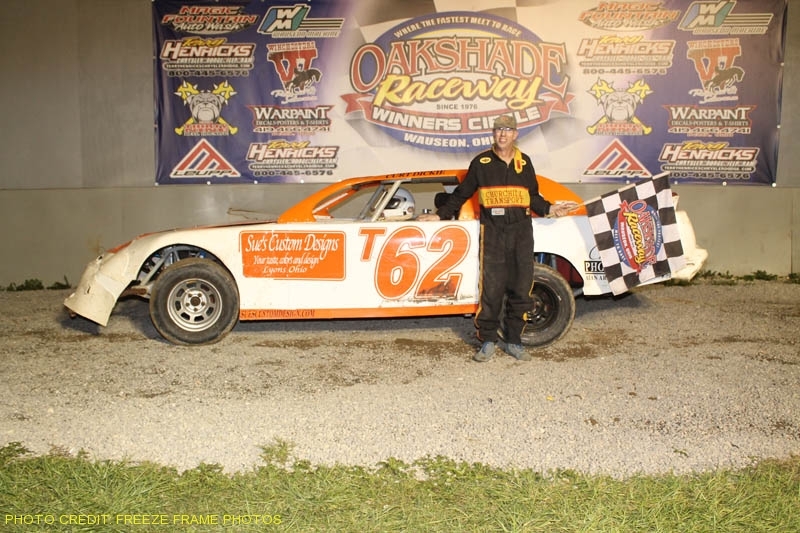 In addition to the scheduled American Late Model Series program paying $2,000 to win on Saturday, September 2, Oakshade Raceway will also host double features for the UMP Late Model Division. The UMP Sportsmen and Bombers will have their races made up the following week on September 9, with double features in both divisions. As always, gates will open at 4pm with racing at 7pm.